Malayala Manorama defines a Hacker properly!! Malayala Manorama defines a "Hacker" properly!! We are all tired of the media equating hackers with crackers ... So it's a welcome change that a Malayalam newspaper has taken the lead in telling its readers who hackers really are: (click on the image above and choose "all sizes" to read the malayalam report) (Here is a Photo Report on Hackerdom 2009) Here is my rough English translation of the Malayalam newspaper article: I TOO WANT TO BE A HACKER Ask these guys what they want to be, and they have only one answer - HACKERS! Insignia 3.0 - Hackerdom, the tech fest being conducted by the Govt Engineering College students is but a step in their journey towards accomplishing this goal. Hmm.... young kids trying to be "hackers" - should get them locked up by the cyber police .... If that's what you are thinking, you are mistaken! These kids are HACKERS and NOT CRACKERS! Hackers are the good guys. They want to make sure that you are able to use with full freedom the software or electronics equipments that you purchase. On the other hand, crackers are dangerous - true hackers do not encourage the "cracker" mentality. 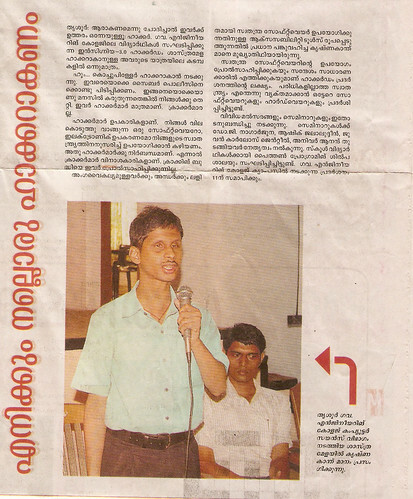 Krishnakant Mane, who is instrumental in making Free Software work to the benefit of the visually handicapped was the chief guest at Hackerdom 2009. Encouraging the use of Free Software and taking its message of Freedom to the masses was the main objective of the event; there were many hardware/software exhibits which demonstrated the power of unfettered Freedom. Seminars and contests are also being organized as part of the event. This is really nice to see that people are being informed about the fine line difference between a hacker and a cracker. Hope someday the hackers wont be recognized as people doing crazy things to break into some network and stealing out data and do stuff like that. Its all the hollywood movies and some sites ( do a google on 'hacker' ) that have created such an impression among the people.